Our Modern kilt is made tough for everyday wear. 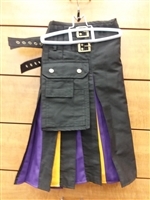 The black denim utility kilt is nice and heavy, it will shame your jeans! The lighter colors are a cotton twill (except for the MultiCam). Four snaps close them at the waist. 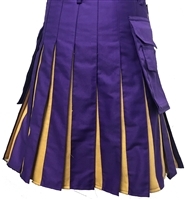 The two belts give you a little adjustment for the hips and help keep the front apron of your kilt down in the wind. 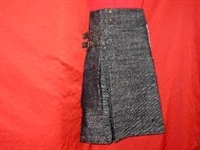 We stock all sizes in black 26-60 inches in 23"length. All other lengths are special order at no extra charge. Aprox. 3 weeks delivery. DO NOT ORDER YOUR PANTS SIZE! YOU MUST TAKE A MEASUREMENT AT YOUR BELT LOOPS. So you like to show your love of country eh? Our Modern kilt is made tough for everyday wear and will your put jeans to shame. Didn't see what you were looking for in stock? No problem! We can get you what you need. Our Modern kilt is made tough for everyday wear and will your jeans to shame. Our Modern kilt is made tough for everyday wear and will put your jeans to shame. Yes Multicam! This is the same fabric our troops are using now in Afghanistan.